The Occupy Chicago Rebel Arts Collective is a network of artists in support of Occupy Chicago. It is a project of Occupy Chi’s Arts & Recreation Committee. Occupy Chicago is here to fight corporate abuse of American democracy in solidarity with our brothers and sisters around the world. 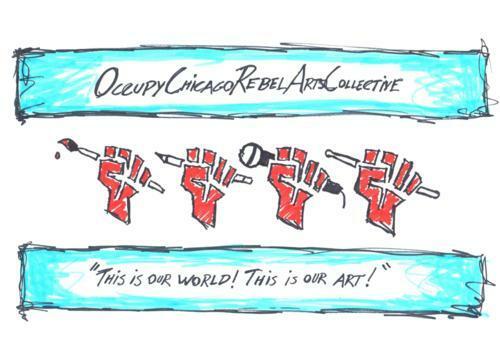 The Occupy Chicago Rebel Arts Collective (OCRAC) exists for the purpose of connecting with artists of all stripes–painting and sculpture, music and poetry, theater and dance–and mobilizing the power of art in the name of a more just and equal world. Culture is a right, not a privilege. Times like these are when the spirit of solidarity can break the segregation of the entertainment and arts industries and make our culture more vital, more relevant. When new images, new sounds and new ways of approaching art are forged. When we show that ordinary people have the ability to run society and create culture without the meddling of the upper 1%. From rock to hip-hop, from expressionism to Dada, from slam poetry to modern dance, from the stages to the streets. This is our world, and this is our art! If you agree, then join us!